There are new cafes popping up every week in Sydney, so I was not surprised to hear a friend suggest a cafe that I hadn’t heard of – Edition Coffee Roasters in Darlinghurst. Yet another new cafe in Darlinghurst, I thought. It was, however, far from what I was expecting. The cafe is not easy to spot – having been dropped off at the corner of Liverpool and Crown Streets, I crossed the road headed in the direction of a cafe with a crowd outside, only to find that it was not the one I was after. I crossed the road diagonally to arrive at a cafe with an entrance, however no name in sight, so I had to ask the hostess if this was indeed Edition Coffee Roasters. I clearly missed the ‘Edition’ nameplate on the awning above. The space is very Scandinavian – clean, contemporary and minimalist. It’s a nice space, although very small. I was pleased to find there was no wait at 11am on a Saturday morning. 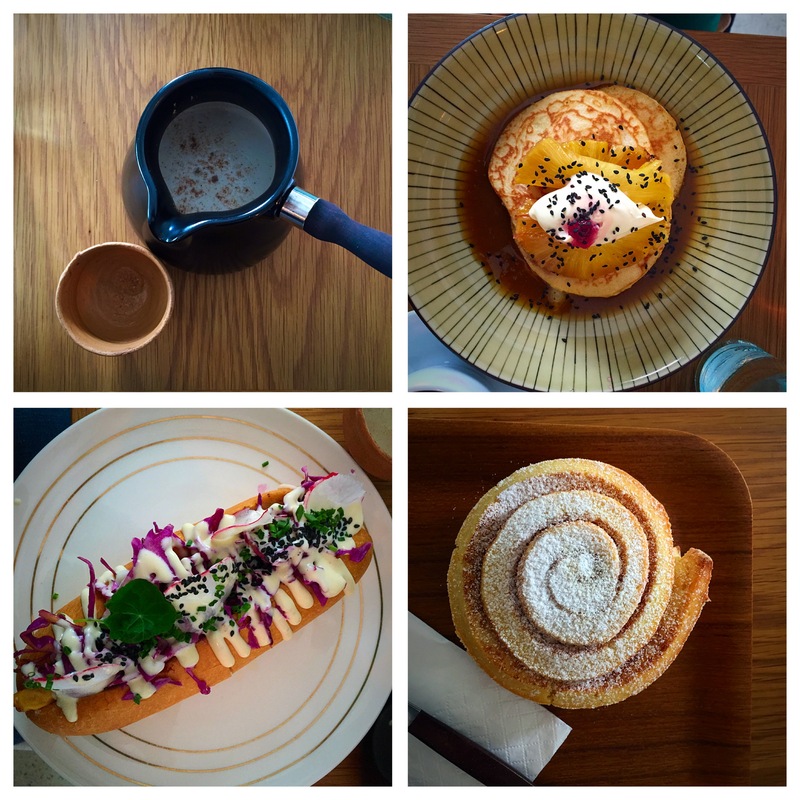 One look at the menu was enough to get my attention – familiar Australian breakfast dishes such as eggs benedict or baked eggs were nowhere in sight. Instead, the menu presented itself with vastly unfamiliar dishes such as Smorrebrod, Grott & Glogg, Oden (Japanese stew) and Fisksoppa (Nordic fish soup) that were a fusion between Japanese and Nordic cuisine. I was pleased to see a wide range of teas available, no doubt as a result of its Japanese influence. Yakuza’s Breakfast – hot cakes, pepper roasted pineapple, miso butterscotch, sakura creme friache ($17): not sure what to expect by the combination of ingredients, I was incredibly happy to see how they tasted together. I was pleasantly surprised to see that it was not too sweet – the pineapple and miso butterscotch balanced each other really well. Porco Rollo – smoked and braised Berkshire pork, tamagoyaki (Japanese omelette), ginger slaw, white miso BBQ sauce, brioche ($13): I was really disappointed with this dish – I was expecting a good brioche, however what the dish came with was nothing more than a plain roll – I should have guessed given it was called ‘porco rollo’. This dish to me was nothing more than an ordinary pulled pork roll that you would get at a stall at a food festival. Cinnamon scroll ($4): the scroll was tasty, however a little too dry for my liking. 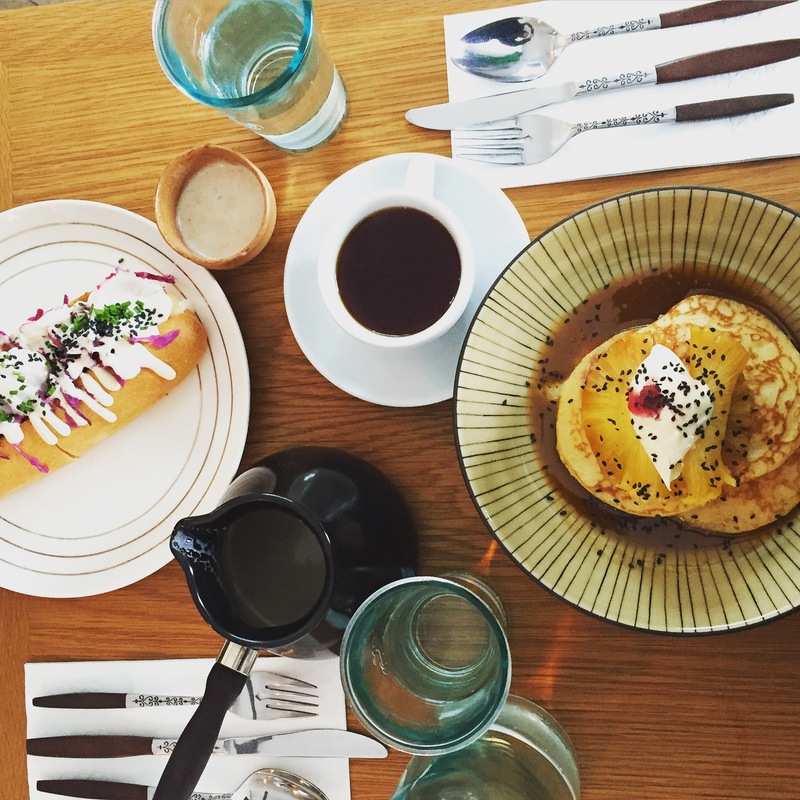 dont forget to order: Yakuza’s breakfast – hot cakes like you’ve never had before! This entry was posted in Cafe and tagged Cafe, coffee, darlinghurst, japanese, nordic. Bookmark the permalink. i loooove the miso butterscotch sauce on the hotcakes, so freaking delicious! Yes! Loved it. How did you like Edition Coffee Roasters?